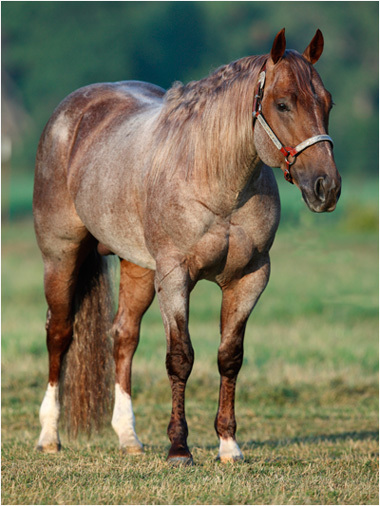 While Metallic Cat has already become a household name in the cutting horse industry, the 10-year-old stallion (High Brow Cat x Chers Shadow x Peptoboonsmal) is starting to make a name for himself among reined cow horse enthusiasts, as well. It is his offspring’s success in that circle that has pushed him to Equi-Stat Elite $5 Million Sire status less than six months after he reached the $3 million milestone. At this year’s National Reined Cow Horse Association Snaffle Bit Futurity, four Metallic Cat offspring – Cats Picasso, Shinen Metallic Cat, SJR Metallic Star and Stylish Metallic – took home checks totaling $96,844 from Reno, Nevada. That sum, combined with the stallion’s $4.9 million Equi-Stat sire record prior to the event, brings his total progeny earnings in the database to $5,029,003 as of early October. Metallic Cat, owned by Alvin and Becky Fults, of Amarillo, Texas, won the 2008 National Cutting Horse Association (NCHA) Futurity Open and amassed $637,710 in less than 12 months of showing, and he has climbed the ranks as a successful sire with the same speed and momentum. With only his third foal crop coming of performance age this futurity season, the stallion has undoubtedly proven his prepotency in the breeding shed. Among the 54 American Quarter Horse Association-registered foals in Metallic Cat’s first foal crop, 62 percent (34 foals) have posted money to Equi-Stat. That 2010 crop’s total earnings exceed $1.9 million, for an average of $57,346 among performers. Overall, nearly 200 Metallic Cat offspring have earned money in the Western performance horse industry, with many of his 3-year-old foals remaining unshown until this year’s NCHA Futurity, scheduled for Nov. 19-Dec. 12 in Fort Worth, Texas.